After having finished the local seminar at Lithuania Television , February 14, 2007, a group of media adventurers decided to search for hidden treasures left in the forest. The expedition was chaired by BAAC local agent Juozas Markauskas. The ”Cold War ” is now history. But the cold weather of Vilnius is not over. And it was cold when we went by car to study television and radio history of Lithuania. BAACs local agent had discovered a secret television and radio station situated in the forest close to the city. We did not receive any official invitation due to the fact that the search had to be kept as secret as possible. No information was spred to the press so far. We went by car. Those who joined the group was : Jan Aasmund Jacobsen from Norway ( He represented the academic researchers in the field) , Tedd Urnes, Norwegian, Andris Kesteris from Canada, Vice- President of BAAC and the head of the expedition: Juozas Markauskas from Lithuania, President Piret Noorhani from Estonia ( The only femal member of the group), Sulev Sepp from Estonia and a local agent from Lithuania – so far his name is kept as a secret. The station was situated hidden in the forest. The building was not old but it looked old. We went from room to room searching for old equipments. Most of the rooms were to be found underground. A television studio for production and a radio studio were established underground. Tunnels everywhere. The goal of the station was to continue radio and television production and transmission in case of war. The air was not good. The rooms were mostly left empty. I found some films and you will see a secret lady on the film? The group has to found out why she was here and what happened to her? My personal result of the search was a printed fire instruction written in Russian, a label, some shots of a lady. No more. 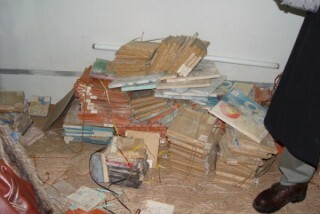 But we also discovered radio tapes left in a room. The technical condition of the tapes was not good. A lot of reservation work has to be done before you start to listen to the tapes. The Cold War is finished. The equipments, the buildings, the production sites are still there. 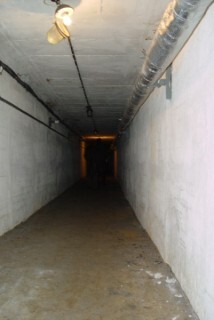 The underground rooms and tunnels should be rebuilt and used for lang term storage of tapes and films. But the building need both painting and new equipments. Anyway, the group went back to the city and had experienced some old history – the smell of the Cold War – and a part of television and radio history of Lithuania. An interesting but a cold, a very cold tour in a site covered with ice and snow. We could feel the Cold War. And we all agreed that we are happy that the war is over. But it is still cold in the underground rooms in the forest of Vilnius.